Countertop is one of the most common applications of marble, which in itself is an extremely popular construction and architectural designing material all over the world. India is a leading producer and global supplier of marble. 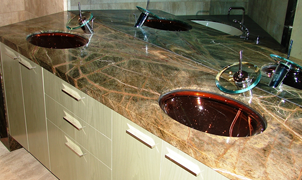 A number of marble manufacturers and exporters from India process and supply a range of marble vanity tops and other products in various countries. For all your marble product needs, you can simply trust the 17-year-old Regatta Universal Exports that holds a global reputation of supplying quality marble products in different countries at very competitive prices. Marble is hard and durable and hence used in different areas of homes, such as kitchens, living spaces and even bathrooms. Though marble can be used on walls and floors, marble vanity tops or bathroom countertop is still its most-preferred application. It is a wonderful addition to any bathroom and imparts a natural yet elegant look the same. Since every marble slab is different from others with respect to surface designs and shades, you can be assured of the exclusivity of your marble slab used as bathroom countertop. 1. Cleaning the Bathroom Countertop: Remove all the stuffs from the countertop surface. Add a little amount of marble cleaner on to a soft cotton cloth and clean the marble completely to make the surface free of stains, grease, grime and dirt. After that, rub the entire surface with a soft dry towel. 2. Applying the Glaze: If the damages are only superficial and there is no deep scratch or gouge, you can make use of a marble glaze to remove small scratches. Using a small putty knife, evenly apply the glaze on the marble surface. Excess glaze should be removed during the process. Glaze can be found in different colors, hence choose accordingly to match with the shade of your marble countertop. 3. Drying the Countertop: Leave the marble for a while to dry out completely and then rub the surface with some marble cleaner using a soft towel. This will bring back the shine of the marble. 4. Sanding the Marble Top: For marble countertops with too many scratches or deep gouges, you would require to take some additional marble repair steps. Begin by completely wetting the countertop with water. Thereafter, sand the whole countertop using a 1000-grit sandpaper and sander until all the scratches are removed. 5. 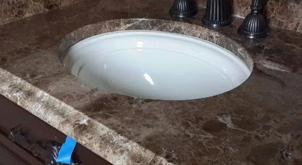 Rinsing and Drying the Marble Countertop: Use a mild detergent solution and soft towel to wash and clean the surface and thereafter, rinse the surface with lukewarm water. Further, allow it to completely dry. 6. Buffing the Countertop: Buff the entire top with a good-quality marble cleaner. Put some deep-penetrating glaze on it and gently buff the surface in circular motions. Try to perform this task by dividing the whole marble surface into several sections and then covering the sections one by one. Keep repeating the process until the whole marble countertop gets restored. Before placing back all the stuffs on countertop, make sure that the marble top becomes completely dry. 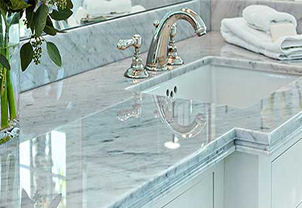 From time to time, one should perform these easy-to-perform tasks to preserve the integrity and look of the marble countertop and maintain the value of your bathroom as well as the property on the whole.